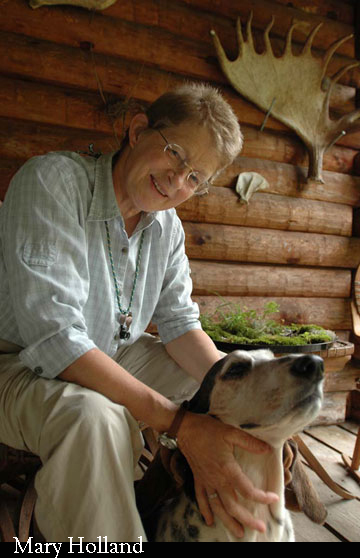 Mary Holland is a Vermont naturalist, photographer, columnist and author with an abiding passion for natural history. She has worked in the field of environmental education her entire life, sharing her curiosity about and appreciation of the natural world with people of all ages. Mary was born and raised in Massachusetts on a turkey farm and attended the University of Michigan’s School of Natural Resources (Naturalist Curriculum). She worked as a naturalist at The Museum of the Hudson Highlands in New York state; directed the state-wide Environmental Learning for the Future (ELF) program for the Vermont Institute of Natural Science (VINS); worked as a resource naturalist for the Massachusetts Audubon Society; and designed and presented the hands-on “Knee-High Nature Programs” for libraries and elementary schools throughout Vermont and New Hampshire. Mary wrote and photographed a nature column called “Naturally Curious” for several newspapers and magazines. She has been writing bi-weekly or monthly newspaper columns for the past 10 years with articles and/or photographs appearing in The Valley News; Northern Woodlands; “The Outside Story”; Upper Valley Life; Here in Hanover; Woodstock magazine; The Harvard Press; The Vermont Guardian; and The Rutland Herald. Mary’s photographic images are available as cards and prints. She also offers powerpoint programs (Beavers, Milkweed Visitors, Naturally Curious) utilizing her photographs and natural history artifacts to libraries, schools and clubs throughout New England. For more information, contact Mary at mholland@vermontel.net .